Costa Rica Sloths - Where to find Costa Rica Sloths? 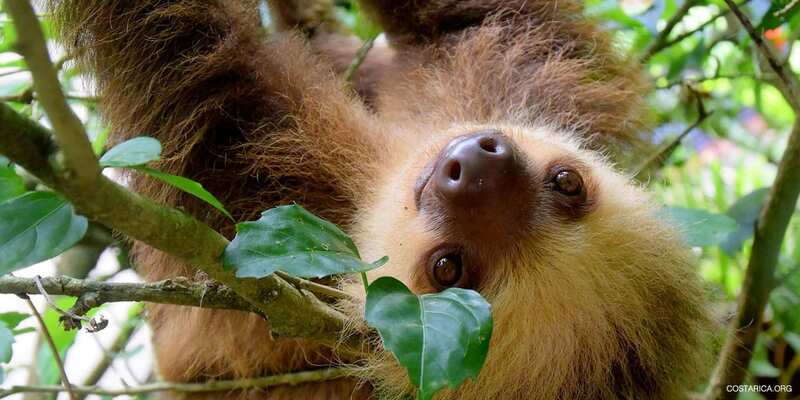 In addition to its dazzling beaches and lush rainforests, Costa Rica is famous for its adorable sloths! You simply cannot plan a vacation to Costa Rica without making time to see these unique and slow-moving creatures. Lucky for you, they are not hard to find! You can visit sloths at the Sloth Sanctuary and Rescue Center , the Toucan Rescue Ranch in San Jose or the Jaguar Rescue Center in Puerto Viejo. Or maybe you’ll see them in the wild at the Manuel Antonio National Park, see them hanging in the trees in the central park of Limon, spot then in Monteverde, Osa Peninsula or near Cahuita. Southern Costa Rica especially has a lot of sloths for you to spot. Sloths are mammals that spend most of their lives upside down in the trees of Central America and South American rainforests. They are famous for moving slowly, which gives them a low metabolic rate. What does that mean? That means that they do not need to eat a lot of food. Whenever they need to eat they must come to the rainforest floor where they are vulnerable to predators. There are two kinds of sloths Costa Rica; the two-toed and the three-toed sloth. Both species have rather distinct differences between them. While the two-toed sloth is nocturnal and can mainly be spotted at night, the three-toed sloth prefers to be awake during daytime. One of the most iconic amongst the latter species, is the brown-throated sloth. But both species of sloths have become rather iconic and practically serve as an unofficial symbol of Costa Rica. They may be cute, but sloths are not the type of animal that you want in your bed. The sloth’s fur works as a self-contained ecological community; algae and mold live in their fur. This not only helps them blend with their environment but provides them with food. They can eat the algae that grows in their own fur and have long claws that can help them with that. Like Owls, Sloths can turn their head 270 degrees in either direction, allowing them to see almost everything around them. And 90% of their time is spent upside down. Imagine that! They can balance themselves in the trees almost better than monkeys, except a lot slower. Have you ever risked your life to go to a bathroom? Sloths do it every week. Once a week, when nature calls, they climb to ground to urinate and defecate, making them vulnerable to predators. Being part of the Costa Rica animals, Sloths do have predators. Jaguars and large birds are known to eat sloths. Additionally, closet to the more populated areas sloths can get attacked by dogs and even hit by cars. There are two types of sloths, the two-toed sloths, which are completely nocturnal, and the three-toad sloths, which are diurnal and nocturnal. Captive Sloths are known to sleep between 15 to 20 hours per day. Wild sloths sleep close to the 10 hours per day, almost like a human being. On the ground the maximum speed of a sloth is 3 meters (9.8 ft) per minute. But when they swim, their speed is almost four times faster. They can reach 13.5 meters (44 ft) per minute. The use of their long arms helps them a lot. Sloths are the most common animal in the rainforest. Even though it may be hard for the untrained eye to spot them, they are one of the best-adapted creatures in the jungle. They spend most of their time in trees, which helps them with predators, and they eat really little amounts because of their slow metabolism. Sloths have become immensely popular in the last couple of years. Some people even visit Costa Rica just to see them! But this has also raised the problem of infrastructure and conservation. Just like with other species, deforestation has threatened the natural habitat of the sloth. You can still find many sloths in the wild from the Caribbean Coasts near Puerto Viejo, Limon and Cahuita to the Pacific coastlines in the Osa Peninsula and Manuel Antonio or more inland in Arenal Volcano National Park, near La Fortuna, and Monteverde. Some of the problems Costa Rica faces, is in both knowledge as well as infrastructure. Costa Rica has been saving a lot of baby sloths after the mother had been hit by a car or perhaps even eaten by a dog. Or adult sloths get rescued just in time but are brought to the animal sanctuary badly when injured. These are problems we ourselves have created and they have led to animal sanctuaries that are packed with new arrivals. Here, they are facing the problem of accommodating the huge number of sloths brought in every year. This has caused a lot of bad press for the Sloth Rescue Center in Cahuita. In 2016, it was reported that more than a hundred injured sloths were lined up in rows of cages in the back where they weren’t even close to mimicking the sloth’s habitat. The owner commented that the main problem is with the rescue centers being overwhelmed by the large amounts of animals brought in. Animal rights in Costa Rica have had a long history of similar problems and is gaining a lot of momentum and press in recent years. Hopefully to the betterment of conditions for sloths and all other animal species in Costa Rica, wild or domesticated.